Last year, I moved halfway across the country to the midwest. Being in the third largest metropolitan area in the United States, I was eager to find fun activities to try. I was very fortunate to move right next to a circus school and after a few days of deep contemplation, I decided to venture out of my comfort zone and try a contortion class. The beginnings of my flexibility training though, started the year before when I decided to complete the P90X workout program. It was Yoga X that didn’t just make me realize just how inflexible I really was, but that with hard work, you can become flexible, even as an adult. Years of sitting down studying, sitting down working, sitting down browsing the internet really took its toll on my muscles. Everything was tight. My coworker promised me that after doing a few weeks of P90X though, I would definitely increase my flexibility. Little did I know that was what Yoga X was going to do to me. I could only watch them do half moon my first few runs through Yoga X. My main goal in contortion class is to get front splits and improve my back flexibility as much as I could, but along the way, I learned several valuable lessons I was able to use outside of class. Abruptly go into a stretch and you risk pulling a muscle – that’s why it’s important to warm up. But I never realized how little patience I had until I wanted to immediately move into the threshold of my flexibility every time I stretched. Yet I would never get there unless I gradually – little by little – moved there. 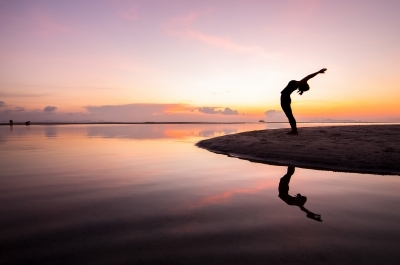 Flexibility is not gained overnight – just like so many other things in life. Stretching slowly encouraged me to have patience, relax, and focus on the immediate task at hand without worrying so much about the next step. Stretching is almost a masochistic activity. You’re essentially putting yourself in uncomfortable positions and holding them for a length of time until your body gets accustomed to it which makes it very difficult to push yourself (partner stretching is the best!). Yet, I see the greatest results when I push myself just a teeny bit beyond my threshold of discomfort. That extra mile is what will makes the most difference. In doing so, you prove to yourself what you’re capable of. Kind of self-explanatory and is related to #2. Being more flexible also enables you to reach into poses that you may not have been able to get into before. But overstretching into injury will most certainly drag you backward as your muscle heals. There is a difference between stretching and overstretching and it can be subtle – if there is any unbearable pain, slowly back out of the pose until you are within manageable discomfort. If something doesn’t feel right, stop immediately and try again when you’re ready. If you force yourself to work hard, your body has this incredible ability to make it easier for you to work. Two years ago, I couldn’t touch my toes. Today, my palms are flat on the floor and then some. Since I started contortion, my sit-and-reach test has improved by 5 inches. Today, I can get into the wheel pose from standing up (also known as a backbend). But before I decided to contort, all of that seemed like an impossibility. I have to trust in my body’s ability to change and trust that I have control over it. Changes don’t happen overnight, but the rate of change is strongly dependent on how hard I work, and recognizing that helps me be more realistic about how long it will take to reach my goals. I’m sure you’ve heard that a lot. Flexibility training is slow and I admit, a (literally) painful process. But the most important thing is consistency. But how do we be consistent? The reason why people stop working out is simple: no progress. But especially with flexibility, it is really easy to go backward. My instructor said that skipping just one day will set you back a week. While I have not measured that accuracy of that statement, I can see why that would be true from a consistency standpoint – you skip a day, you skip another, and it becomes a runaway train – you develop a habit of skipping stretching sessions and you really will lose all the progress you’ve made. Creating a habit out of stretching will ensure you don’t stray off the track. Stretching doesn’t cost money and you can do it just about anywhere – just reach down and try to touch your toes and there’s an easy hamstring stretch. If you have a story to share about how your fitness journey has taught you some unexpected life lessons, I would love to hear it in the comments section!